Defence Secretary Sir Michael Fallon has announced a contract worth up to £55 million for 56 innovative bomb disposal robots. 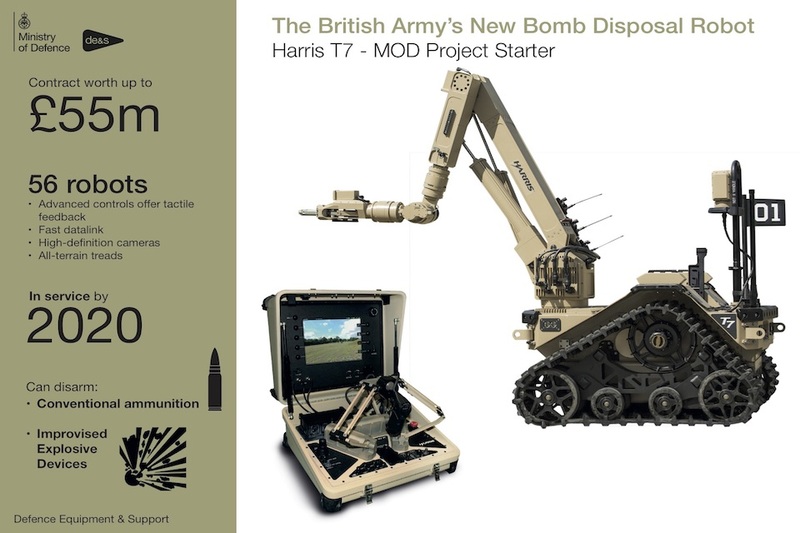 Following an initial £4 million demonstration phase, the robots will be purchased from US robotics manufacturer Harris under the MOD’s Project Starter for use by the British Army, and will be supported by engineers at Harris EDO MBM Technology in Brighton, where the contract will sustain 10 highly-skilled jobs. In a keynote speech, the Defence Secretary outlined how the Harris T7 robots use ‘advanced haptic feedback’ to allow operators to ‘feel’ their way through the intricate process of disarming from a safe distance, protecting UK personnel from threats such as roadside bombs. “Equipped with high-definition cameras, lightning-fast datalinks, an adjustable manipulation arm and tough all-terrain treads, the robots are able to neutralise a wide range of threats. The announcement comes after a competition between the world’s leading manufacturers, organised by the MOD, with the new fleet replacing the current Wheelbarrow Mk8b. All 56 robots are due to be delivered to the UK and in service by December 2020. A sensible and useful purchase. Despite comments by other board users, I am not left wing, have never voted Labour or Liberal Democrat and am not a moron. I have paid my mortgage off, have a new car which I bought outright and my wife is not sterile. I do not claim any form of social allowance. I am not Russian.